Contact your veterinarian if your pet experiences any of the following while taking Previcox for Dogs: abdominal pain, tenderness, or discomfort, bloody, black or tarry stools or blood in vomit unexplained weight gain, water retention, fatigue or lethargy, skin rash, itching, yellowing of eyes; unusual bruising or bleeding as these symptoms could indicate serious side effects. Immediately seek emergency care if pet experiences an allergic reaction, symptoms include, difficulty breathing, swelling of the lips, tongue or face, hives. The recommended dosage of Previcox for dogs is 2.27 mg/lb (5 mg/kg) body weight once daily. The tablets are scored and dosage should be calculated in half tablet increments. 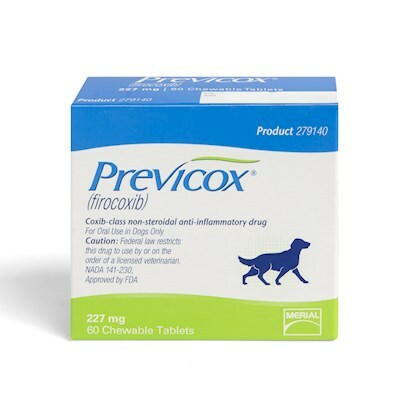 Previcox for dogs can be administered with or without food.